MTS is the largest GSM operator in Belarus. Its services are used by approximately 5.4 million subscribers. Therefore, MTS packages are widely popular among those interested in the call origination and termination in gsm Belarus. At the same time, the operator is the provider of the fixed Internet. From this point of view, the use of SIM-cards for MTS is not safe for the terminator, because in addition to the SIM-block in the Republic of Belarus there is a practice of blocking Internet traffic for those suspected in VoIP termination. However, this does not stop entrepreneurs from around the world, who place their voip sim gateways in Belarus. The average voip rate costs 27 cents and low prices for local calls promise huge profits on landing GSM traffic. The main thing is to efficiently protect the SIM-cards against the antifraud systems which are sufficiently stringent to Belarus. It is also possible to use a VPN server to provide encryption of traffic transmitted via the network. The SMART line provides free minutes for calls within the network and Internet traffic, for a fixed monthly fee. The standard SMART package costs $1.56 for new subscribers, and you get 1,000 free minutes at the same time. When connecting to SMART +, a client can use the same 1,000 minutes for the same price, but instead of 1 GB Internet, there are 2 GB provided. Increase your revenues from GSM termination in Belarus, using GoAntiFraud! We provide you with proven tools to protect the SIM-cards from the lock and will render professional assistance in setting termination logic, in accordance with the characteristics of your country. Since the Internet does not interest us in terms of VoIP termination, the SMART package is more suitable for landing calls (the call is charged at about $0.0015), with a terminator not to be able to use 2,000 minutes, due to the hard Belarusian antifraud. But all depends on the amount of traffic that you want to terminate on a daily basis. Having high load on the GSM gateways, you can provide the cost of a minute of conversation at $0.0007, using SMART +. Packages SMART MINI and SMART LIGHT offer a small amount of free minutes for the same $1.56 for new subscribers - 250 and 500. They are not that beneficial for VoIP termination. The ABSOLUT tariff plan offers unlimited free calls to all numbers in Belarus, but the first advance payment amounts to $62.55. The Great and Communicate packages are optimal for those who are going to redirect international calls to other operators. GREAT provides NL inside the network after 1 minute of conversation (the first minute will cost $0.021). But for the same $ 0.021 per minute, you can make calls to other operators (first 60 minutes). Then the tariff will cost $0.042. The same refers to the COMMUNICATE package, with MTS providing the unlimited after you have spoken 3 minutes (the three minutes are charged at $0.031). Calls to other operators cost $0.057 per minute. The most favorable options are SMART and SMART +. Terminating for 5 hours a day in Belarus, you can make more than $1,500 via each channel, using SMART. 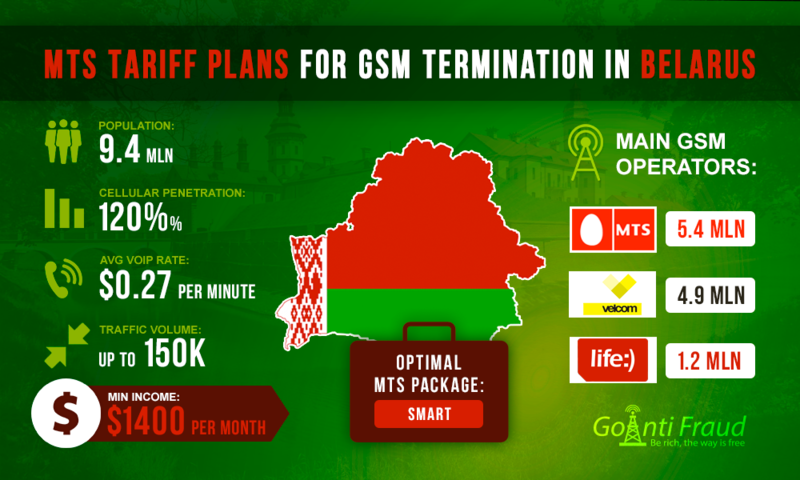 Do you plan to invest in the GSM termination in Belarus? You will be interested in GoAntiFraud NewBusiness offer for beginners. This is a business package that includes everything you need to work at an early stage. In addition to VoIP equipment, AntiFraud protection tools and convenient software, we provide professional technical support at all stages of your business!